There exists a strong route potential from Bergen (BGO), Stavanger (SVG) and Aarhus (AAR). In addition to the O&D market, there is an even greater transfer potential using HEL hub to Asia, Russia and the Baltic region. Spain is in the hearts of Finns. The top three destinations from Helsinki are Malaga, Barcelona and Madrid (67 000). 40 % of the travelers to Barcelona and 60 % to Madrid travel indirectly to their destination indicating a demand for more direct flights on these routes. Nice is the second most popular city in France among Finnish tourists. Furthermore, there is an excellent transfer potential to Asian destinations via Helsinki. Sofia is one of the main unserved destinations from Helsinki. It would provide excellent connections to Asia. Generally there are good connections to Germany but Stuttgart is an unserved destination. Annual market from Helsinki to USA was 314 000 passengers in 2009. The main destinations for the indirect routes are NYC, MIA,SFO and ORD. Currently HEL has only one direct connection to the US (JFK). Around 40% of the demand is from the USA and the rest from Finland. 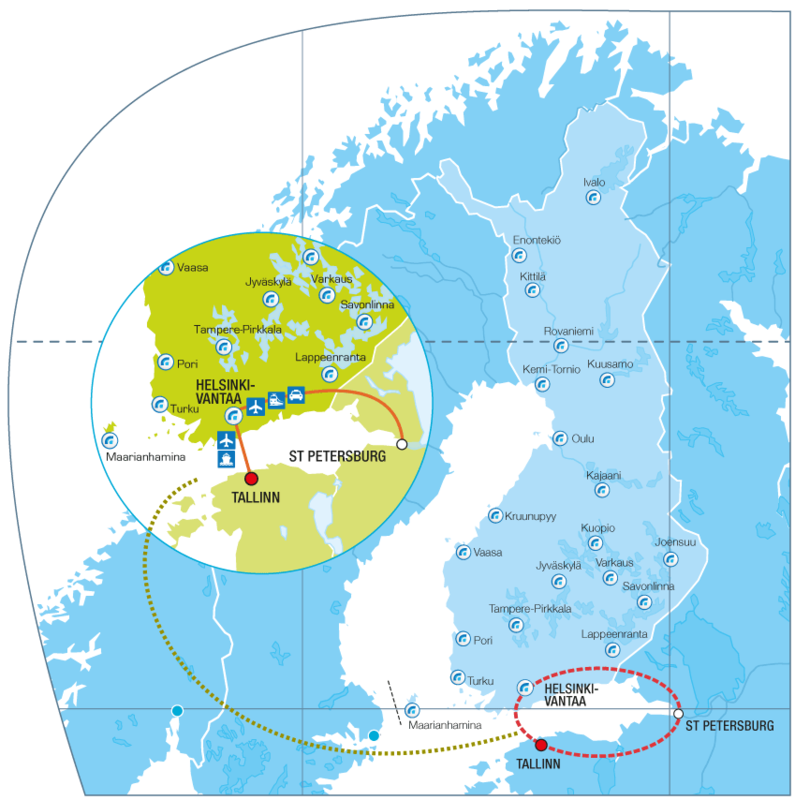 Helsinki offers a smooth route to Eastern European and Russian markets. 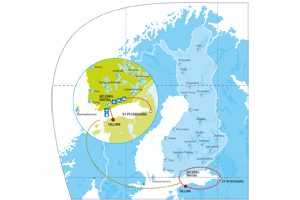 Helsinki is on the flight path between the US and major Russian economic centers such as St. Petersburg and Moscow. Thanks to its geographical location, Helsinki Airport is on the shortest route between Europe and Asia. 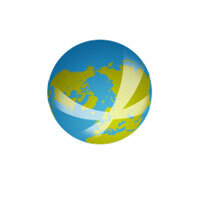 With over 10 direct destinations, it has the most destinations to Asia from Northern Europe. Main destination is Bangkok but other destinations are steadily growing.Kuala Lumpur is one of the unserved Asian destination to which Helsinki would cater the smoothest connection. No queuing for slots. Please visit www.online-coordination.com and www.helslot.fi for available slots. Helsinki Airport has been “a green approach airport” already for years. 60% of current flights can benefit from CDA concept and the number is increasing. Helsinki Airport is known for the high quality and reliability of its modern services. We have been ranked at the top of the league in Europe in passenger surveys (ASQ) for 10 years running. Helsinki city centre is only 30 minutes from HEL: The Airport buses run every 10 minutes from early morning to late night seven days a week. The Helsinki area is the region in Finland which global corporations usually choose for their headquarters. Nokia, Kone, TietoEnator and Neste Oil, just to name few of them. MEK supports tourism industry businesses and groups in developing and marketing tourism services for the international market. Helsinki City Tourist & Convention Bureau markets Helsinki as a travel destination and develops travel services with local businesses. It also represents Helsinki at international travel fairs and organises familiarisation tours for travel organisers and media representatives. A publicly funded company supporting international professionals and companies by promoting all that the region has to offer. Invest in Finland offers a full set of professional, hands-on investment services that are always tailored according to your specific needs. The services cover every stage of setting up a business in Finland, ranging from initial data collection and opportunity analysis to networking and the actual business launch. For more information about freight traffic please visit our website, or contact our route development team. Helsinki Airport is located in the middle of traffic streams. 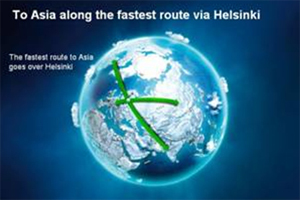 Via Helsinki is the shortest route between Asia-Europe / India-USA and thus the fastest connections. In Helsinki Airport everything is under a single roof. 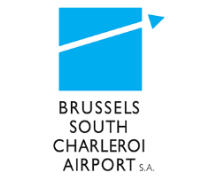 The airport is a compact and transferring is easy and efficient. There are no terminal transfer e.g. by bus or train and the distances between gates are short.